The exploration of new worlds, strange environments with rules and challenges different from our own, is a staple of many Starfinder games. The challenges posed to the players can be environmental; lava, ice, desert and jungle planets abound, seasonal; such as migrations and monsoons, and the weird and unique creatures that inhabit these places. This week’s creature is the dusk runner and it inhabits one such strange environment, the eyeball planet. As with previous weeks, this creature is intended to provide players challenges beyond combat and the dusk runner excels in creating and modifying challenges during journeys across normally inhospitable environments. This shaggy horse-like creature glares with lidless orbs of white fire and in the shadow, it is difficult to count the creature’s limbs. In any area of natural dim light, a dusk runner may use the run action to gallop across any surface as though it were clear, solid ground, allowing it to ignore non-magical difficult terrain, run across water and even across the air itself. A dusk runner constantly regulates the light levels around it, dimming the day and lighting the night. All light within 40 feet of a dusk runner is reduced (or increased) to dim light, regardless of ambient light levels. In addition, all creatures treat both hot and cold weather as one category less severe while they are within a dusk runner’s penumbra. 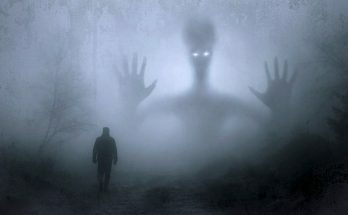 A successful DC 13 Charisma check can allow a creature to use magical effects to light (or darken) the area within a dusk runner’s penumbra, though this also suppresses its environmental protection. A dusk runner cannot voluntarily suppress its penumbra. Dusk runners are stubborn and willful creatures that resist all attempts to tame or befriend them. Their initial attitude with all creatures other than other dusk runners is unfriendly. Any attempts to change their attitude using Diplomacy take a –2 penalty and a dusk runner’s attitude will quickly revert over time, decreasing by one category every 1d2 days until it has returned to its initial attitude. Further, any effects with the charm descriptor affect a dusk runner for half the usual duration. When a planet’s day is the same length as its year, only one side of the planet will ever see the light of day. An endless day. While the other half dwells in endless night. Upon such planets, dusk runners roam, protected from the scorching day and frigid night alike by their unique abilities. Given the lack of natural predators adapted to their environment, the dusk runner holds little fear and no small amount of scorn for other creatures. Neither are they predators themselves though they are omnivorous and will dine upon dead and dying creatures they come across, including other dusk runners. Settlements upon planets populated by dusk runners often go out of their way to locate dusk runner territories and migratory paths, as these creatures can protect expeditions and travelers from the hostile climate of these planets. Though they can be reasoned and bargained with, dusk runners are naturally unfriendly and callous and more than one expedition has been abandoned to the elements by these creatures as they slept. Too often, the exploration of planets with hostile environments is dealt with by players either powering through (and hoping to make all those Fortitude saves) or entirely avoided via magical or technological means. Dusk runners can act as contrary traveling companions for players, allowing them to overcome the challenge of hot and cold weather while presenting the players with challenges of their own. While it may be simple enough to persuade a shade of dusk runners to accompany an expedition, the creature’s willful special ability requires that players are actively engaging and placating them throughout a journey or risk abandonment. Further, dusk runners are excellent at modifying the difficulty of other encounters and challenges. The addition of dim light to a challenge can greatly affect its difficulty and a sudden defection or abandonment of a party by a dusk runner can throw a chaotic wrench into a tense situation. That’s all for this week, join me again next for the final creature in our series exploring beyond combat.